Aha, I went to the train station just nearby and asked about catching a train to the city, the nicest man at the ticket office gave me a map, took me outside and showed me where to catch a bus to town. Much easier and cheaper than the train he told me. 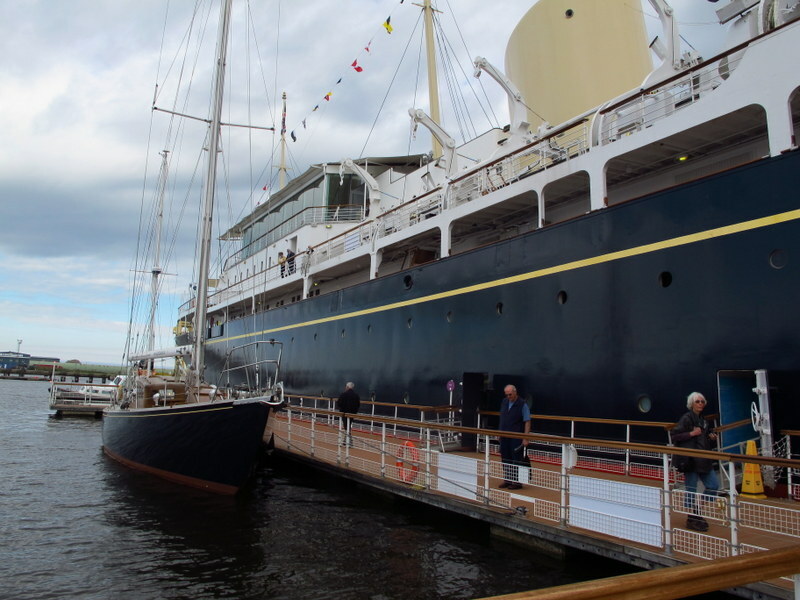 So, armed with my new-found information I then caught another bus from the city down to the port area to see the royal yacht Britannia. It’s the funniest thing, you go into a shopping centre to access the yacht – who’d have thought? They have the gift shop in the shopping centre, it’s massive, and as the centre is right on the water, they have steps and gangways connecting the two, amazing. I’m sure it wouldn’t be everyone’s cup of tea but I was really keen to have a look at it, also, it’s something a bit different to most of what I’ve been seeing. I even had tea and cake in the café on board, not sure I was sitting where the royals sat but you can’t have everything can you. 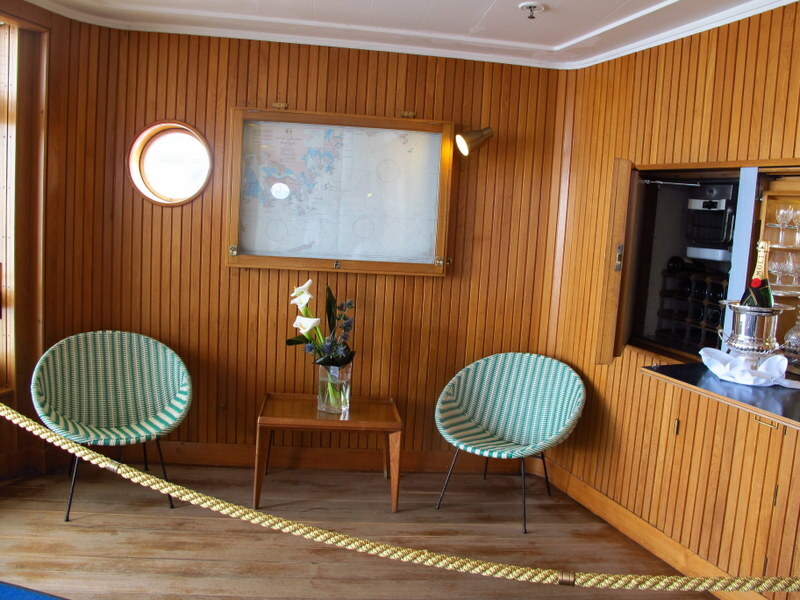 She was built in 1952-3 and sailed over one million nautical miles and there’s not one nut or bolt or whatever holds ships together on here outside skin. That’s about as technical as I get – the bit about nothing marring the outside skin stuck with me, it’s something I wouldn’t even notice but supposedly is quite significant. 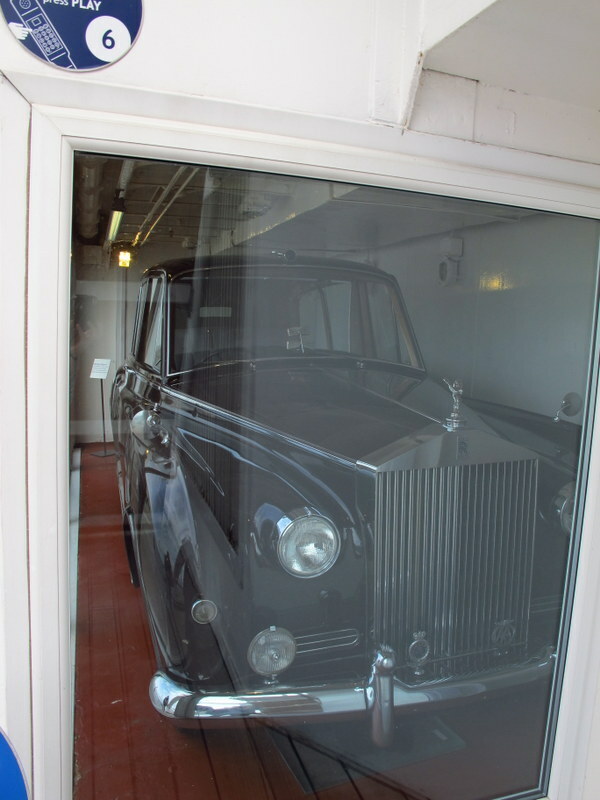 The Rolls Royce car in a special garage on the deck was something you don’t see every day either. Why wouldn’t you take your car with you on a sea voyage? Considering she was decommissioned not that long ago, or so it seems to me, it seems quite dated and not overly elaborate . I remember my family having plastic saucer chairs just like the ones on board. I can’t see we had the same standards or quantity of china or silverware though. I had an absolutely great time traipsing around from top to bottom and yet again was sorely tempted in the souvenir shop – but I didn’t break, yay me! I got back to the city okay but went too far on the next bus. I’d asked the driver if he went near the train station close by the apartment, yes, he said, so on I got. Well, we might have gone near it but we didn’t see it so I was merrily sailing along, way past where I wanted to be. I started to get worried when we went on a bloody freeway – crap, where the f$*k are we going? Anyhow, at the next stop I asked the smug looking so-and-so, and he let me off and gave me directions on how to get back. He would have to be about the tenth male in England to give me that “how has she made it this far” look. But, on the bright side, I only had to walk back about 15 minutes – I should have just walked from the city, I’d have been better off. Ah well, another lesson learnt today – don’t be lazy – just walk! Yeah okay, it’s a bit flasher than your average tinny! Fosters on tap on the Britannia!